Collecting original L&B "Littauer & Boysen" Victorian articulated paper dolls from the late 1800's has been an incredible journey and I'm always looking to learn more about them. 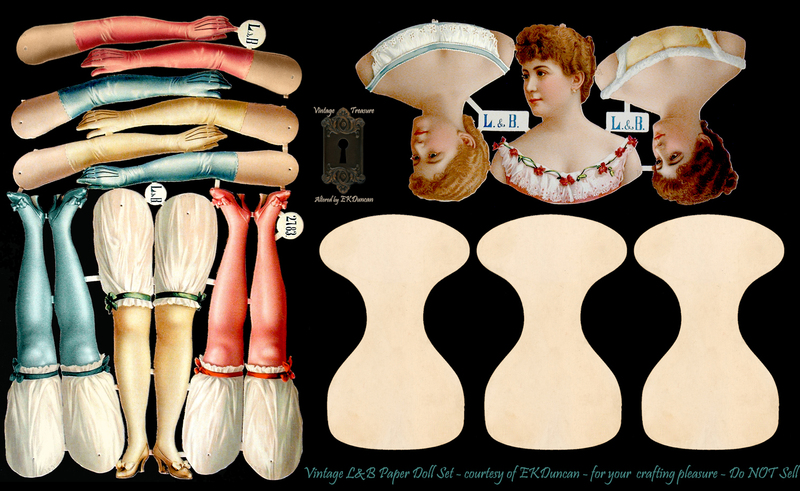 Today I wanted to give you a bit more information on L&B Articulated paper dolls and the items they produced, based on the information I've been able to discover so far. 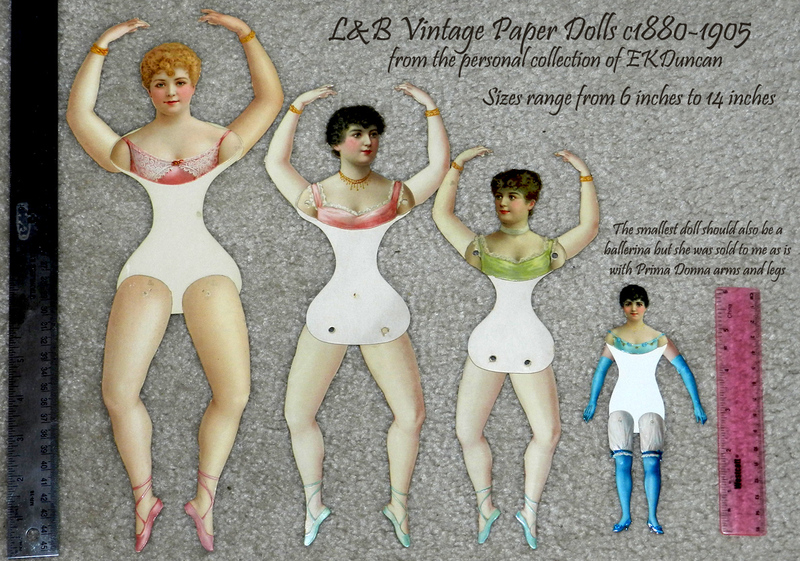 The Ballerina and "Prima Donna" jointed paper dolls were made in Germany by L&B (Littauer and Boysen) which was one of the top chromolithograph printers of the day. They produced these dolls under their L&B brand and made others to be distributed here in the US by the Dennison Manufacturing Company. 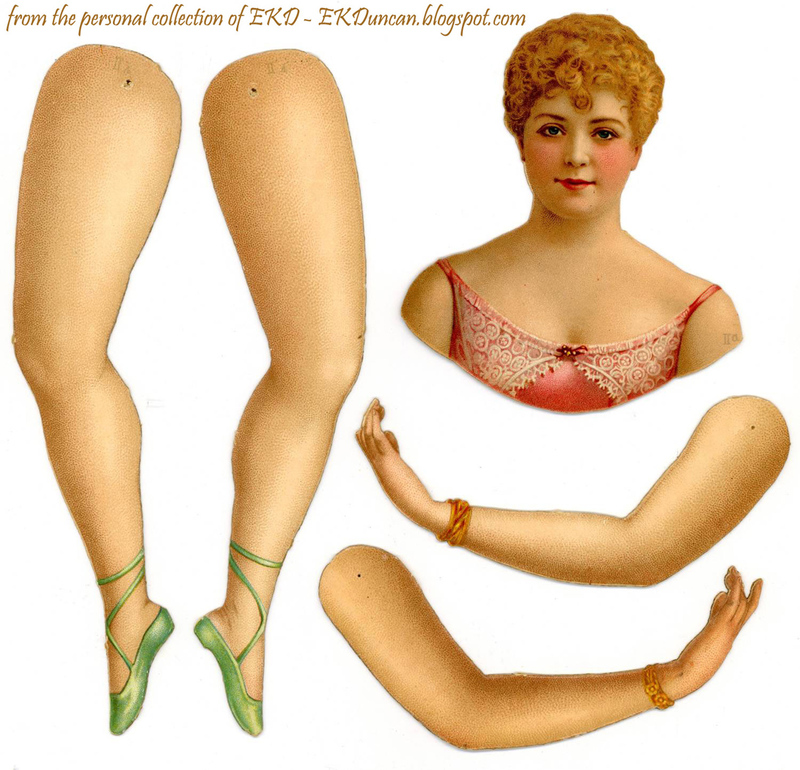 The dolls were made in several sizes and some were available as a single doll, some in sets of 3 and there were also accessory sheets of arms and legs that could be purchased with sets of 3 sets per sheet. 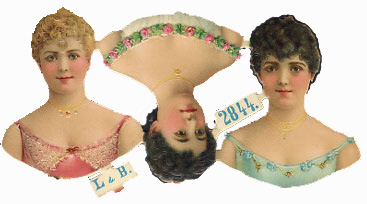 The "Prima Donnas" as they were named by Dennison Co in their catalogs, are these Bloomer Girls. Many of the dolls were available in various sizes. The smaller dolls assembled were 6 inches and the tallest assembled doll is stated to be nearly 17 inches tall. The "Prima Donnas" are suppose to be three of the top actresses/performers of their day. The brunette in yellow could be Maud Branscombe or Mary Anderson. One of the more common and easy to collect set of "Prima Donna" dolls by L&B "Littauer & Boysen"
The above set of dolls is one of the easier sets to find and collect. to find them in attached sheets as you see here. I made several digital fixes to this sheet as well as adding in the torsos so you could see what a complete set would look like. The dolls in this set are the large size and in their assembled state would create 14" dolls; they do not wear necklaces; but their was also a smaller 6 inch set (see farther below in the post) of them where they are wearing necklaces. This is one distinction that seems to be common with the smaller dolls made by L&B, and sets them apart from the bigger dolls. There are probably other sizes of these dolls floating around out there but these are the main sizes I have in my collection. I was actually pleasantly surprised by the sizes of the middle two dolls when they arrived, since most of my dolls are the larger 14-15" size when assembled. sold by them but I've yet to personally find one that once assembled is that large. A page from my 1905 Dennison catalog showing the doll sizes and prices. 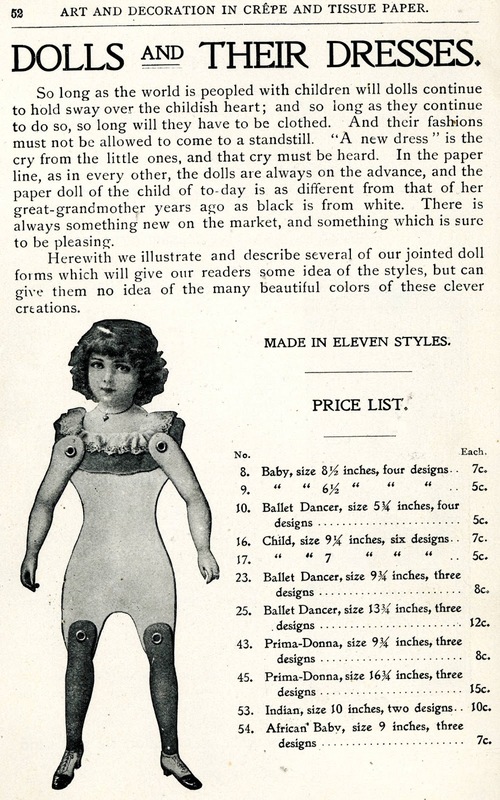 The above page from my Dennison 1905 catalog shows the various dolls and sizes they were still selling in 1905. Dennison purchased their dolls from L&B, assembled them with eyelets and sold the dolls to complement their line of crepe paper which you could use to decorate the dolls. 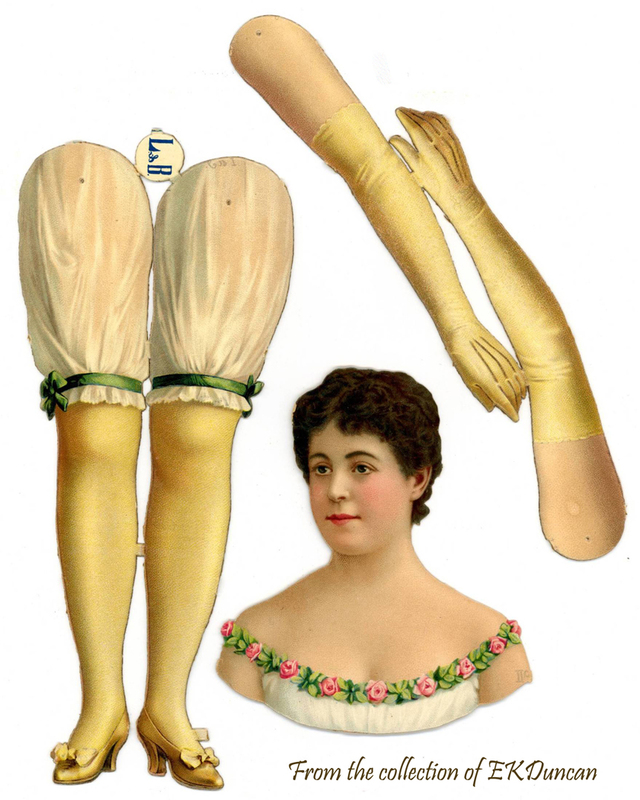 According to the 1905 catalog Dennison sold the Prima-Donna "bloomer dolls" in the 2 larger sizes (of 9 3/4 inches and 16 3/4 inches) and there were three designs to choose from. 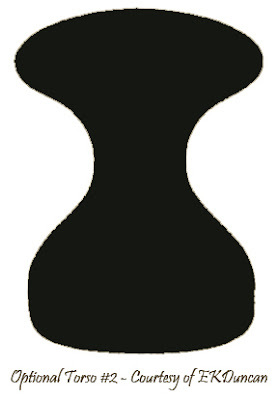 This would be the 3 dolls shown at the top of the post. 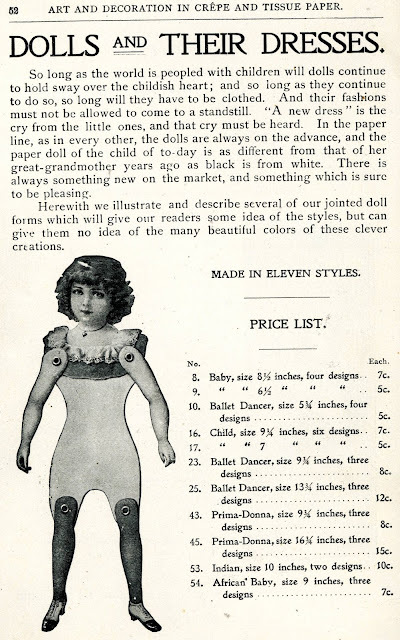 I know for a fact that L&B also made these dolls in the smaller 6" size but Dennison was not selling them in 1905. 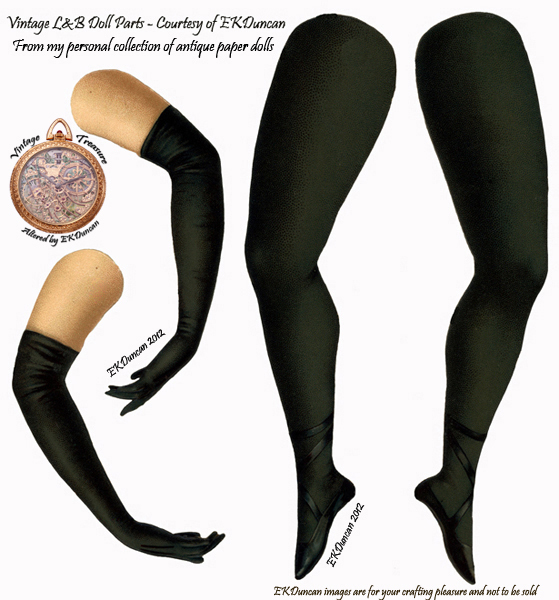 The ad page also shows three sizes for the ballerinas 5 3/4, 9 1/4, and 13 3/4 inches. while their was a fourth option in the smallest size. pictures of these dolls since L&B made more than 4 ballerinas over the years. I know that L&B produced more than 4 ballerinas but I've not yet seen more than 3 Prima Donnas. Since the dolls were originally produced in the late 1800's it is possible that prior to 1905 Dennison sold other dolls made by L&B not represented in the 1905 Dennison catalog; however I'm not finding where Dennison sold the uncut L&B dolls sheets so I believe those were sold elsewhere. but not the smaller Prima Donnas (bloomer girls), it just seems a bit odd to me. digital set I located on the Internet years ago is what started me collecting the real thing. that I also made this pastel version as an alternate option. 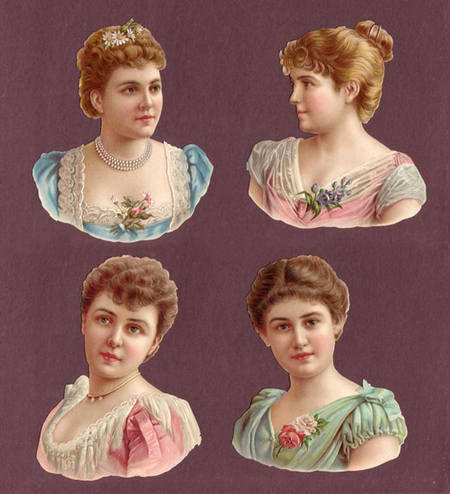 Please note the necklaces the ladies wear in this set, which distinguish them as a 6" set of dolls. So far none of the larger versions of these "Prima Donna" dolls I've collected wears a necklace. It will be interesting to see if I ever run across a large L&B "Prima Donna" with one. 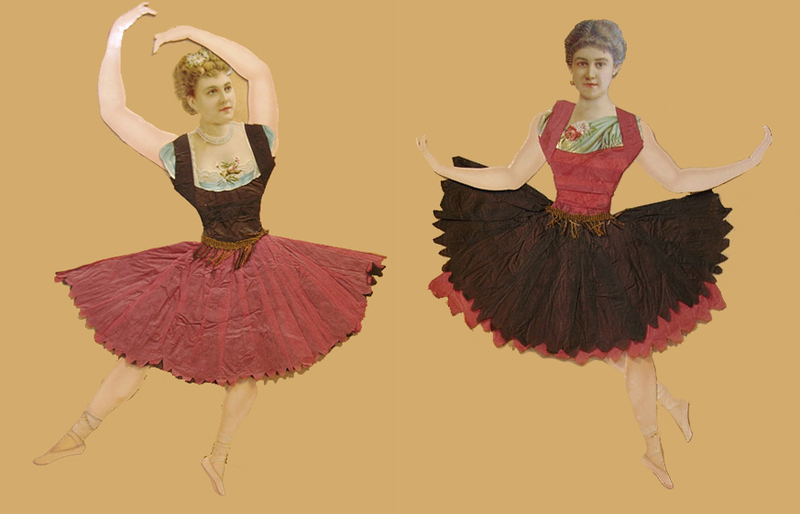 Some of the Large ballerinas have necklaces like the Royal paper doll from my previous post - HERE as do some of the other ballerinas missing from my collection (see the bottom of this post for photos). sadly I've not been able to collect a fully intact set (Heads and Legs). I will post what I have so you can see what it should look like if complete. in color so I did a bit of digital correcting to make them more presentable. I enhanced them so they did not look like a pale reflection of the blue ones. I like variety in my ladies so I thought you might like three distinct pairs of slippers as well. 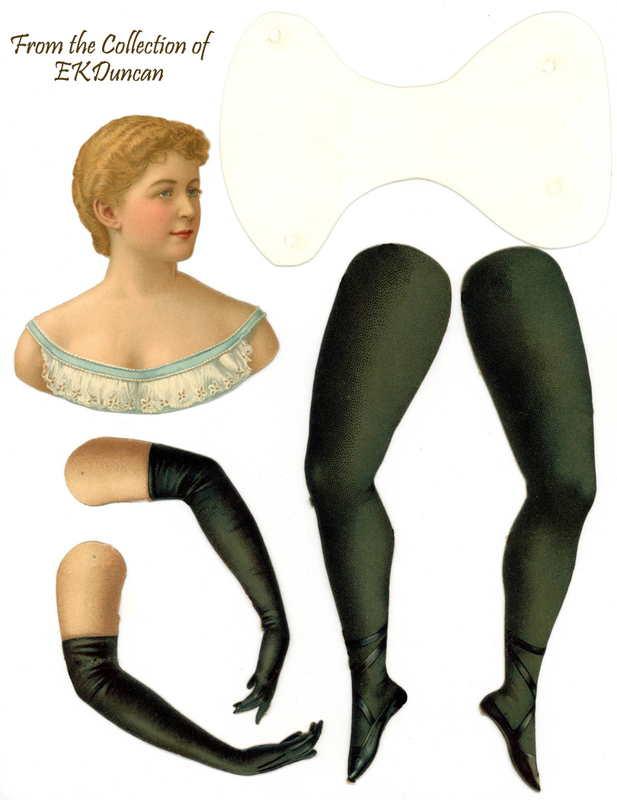 If I'm able to get an attached set of heads to go with the ballet legs they would look similar to this set. Sorry but this is the only image I have of what an attached set of ballet girl heads looks like and you can tell from the necklaces they wear that they would be the mini 6" version and not the large ladies I'm looking for. I actually own a full size of the first two ballerinas and a mini 6" size of the last doll but she came with the incorrect Prima Donna bloomered legs and gloved arms when I bought her. I digitally re-created the set of ballerina heads from parts and pieces in my collection. This way I have the digital version of all the necessary heads to go with the full set of ballet legs. 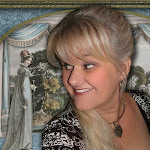 The Blue Doll is possibly actress Pauline Hall - I've not posted her doll yet, but soon. modifications that I'll share on a later post. to add into my "original" collection. Next time I'll try for an attached set or a full sheet. This is what the digitally repaired parts now look like. with the the other L&B parts already posted and those I've still to post. A black torso makes a great under layer for the other black ballerina parts. This one should be an exact color match to the legs and gloves when you print it. I have many dolls yet to post and several more beauties I'm still hope to one day acquire in my ever growing collection. 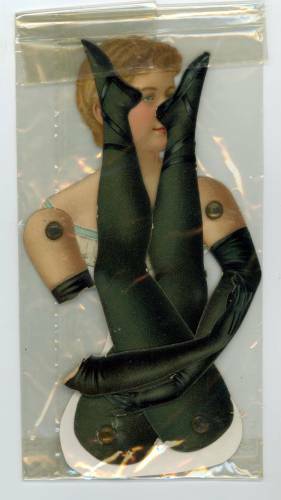 On occasion while surfing the web I get a glimpse of an L&B articulated lady or those similar to them which I can't wait for the chance to get my hands and scanner on. get a good digital version if I can't have the original. These two beauties were photographed at the 2008 Paper Doll Convention and belong to a Jan McKay - lucky lady! 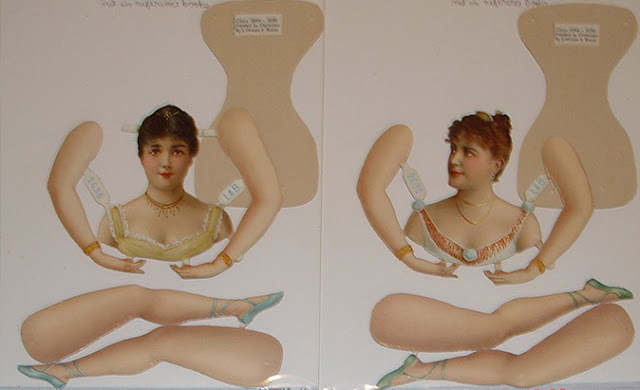 When I pulled up this photo to post it here I noticed the the labels on the two torsos here is identical to a label on one of the torsos of a L&B Prima Donna dolls in my collection. Now it makes me wonder if the more common L&B doll I own was ever in the same collection these two beauties originally came from???? Maybe one day I'll have the fortune to add these two and many more to my collection. I've found two that are nearly identical and I have to wonder why that might be??? 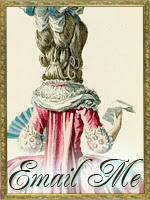 of one of my L&B dolls you will see in an upcoming post. different doll heads but with same bodice style and necklace??? The two ladies favor each other a bit in the face and since they have the same style of bodice and wear the same necklace...are they sisters, are they the same actress just in two different versions??? when I've not seen this before with any of the other L&B articulated dolls. Another L&B mystery for me to add to my growing list. Another of the L&B Beauties I'm still hunting is this one. I keep missing the boat on getting this doll in my collection. It seems like I keep missing out on getting this doll. and lucky bidder got an assembled one in near mint condition for less than $25. Oh well - one day I'll have one of my very own!!! and there could be others I've yet to discover. with the other L&B doll parts. 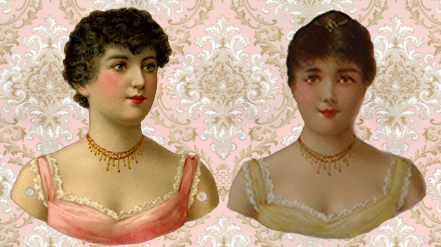 This week an interesting pair of assembled and decorated articulated dolls in the style of the L&B ladies were on eBay. They sold for close to $40 with shipping. I do not believe these two dolls are L&B but they do favor them in a remarkable way. who manufactured these dolls since I love the faces on these ladies. and have really peaked my curiosity. I considered bidding on the beauties but after asking the seller a few questions I discovered the crepe paper was glued to the font of the bodices and I did not think I'd be able to digital restore them properly. You have to pick your battles wisely, so I let them go to another bidder. I do like the way they were decorated and thought you might get inspiration from seeing them too. Update 10-21-12: Just my luck, sigh! It appears I missed out on these 4 doll heads on an eBay auction that ended 10-16-12. This set of c1880 embossed heads came out of an old scrapbook and what beauties they are. 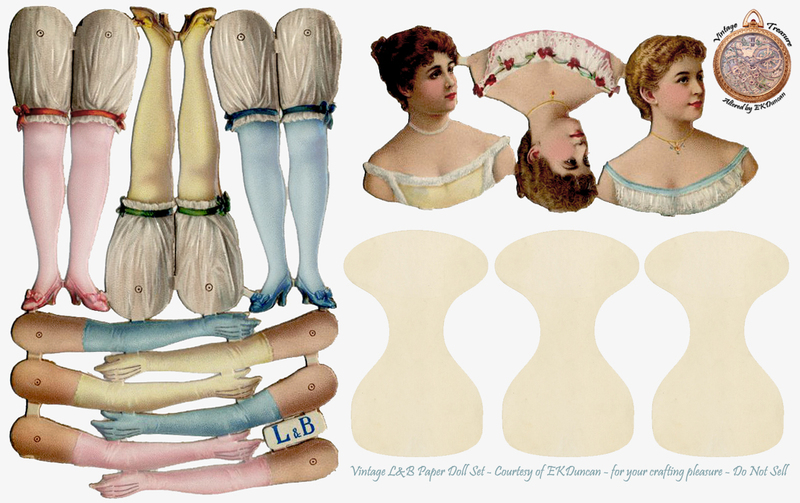 are the same ladies used on the above set of dancing dolls. According to the seller each head measured 5 1/2 inches tall so my guess is the German manufacturer made these in several sizes since the assembled dolls don't have heads that large. These would have been great to scan and then size down to use with the L&B doll parts. Oh well, I've now adjusted my eBay search so maybe next time I'll not miss out on a gem like these. The auction winner got them for $26 including shipping. I hope you enjoyed the more traditional L&B dolls I've posted for you to play with today. I've altered and the variety of color choices she now comes in. 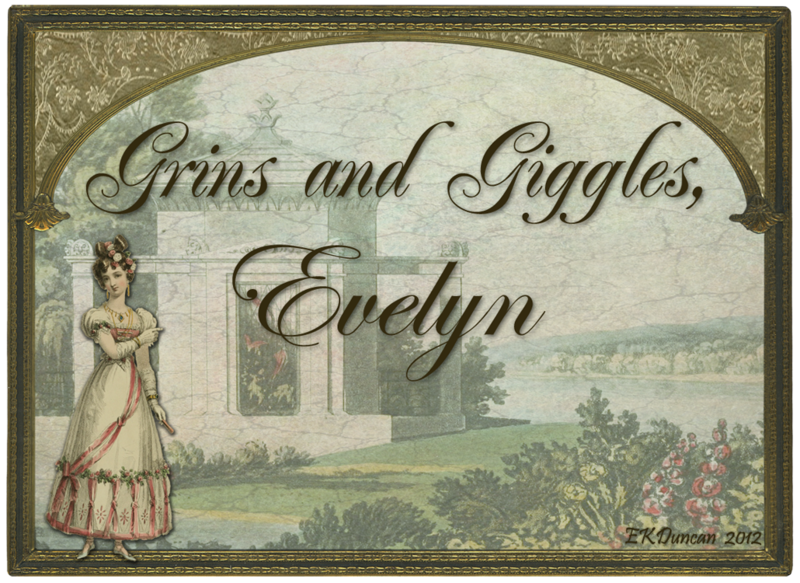 Interesting history of these ballerinas, I think I'll do more research, thank you! The second picture shows very well how the ballerinas are assembled and how they must have especially in the central part and for the arms, because I did not think it was like that. They have very beautiful faces with their delicate features. 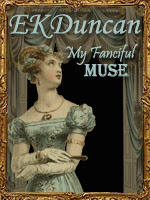 I love the Victorian era where it was very beautiful drawings of lovely ladies and their beautiful costumes. Thank you sooooo much for sharing such beautiful things! Thanks Sylvie - I have been collecting these L&B (Littauer & Boysen) dolls for several years and I love them all - dents, dings, scratches, holes, rips,broken parts and all. Sadly there is not a lot of information out there on the Ballerina and Prima Donna dolls that I've been able to locate; but if you find any good resources please let me know. I'm always looking to farther my L&B paper doll knowledge. Here are a few resources you may want to look at on the web. 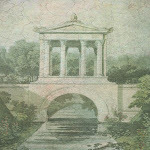 Thanks for sharing the images and information. 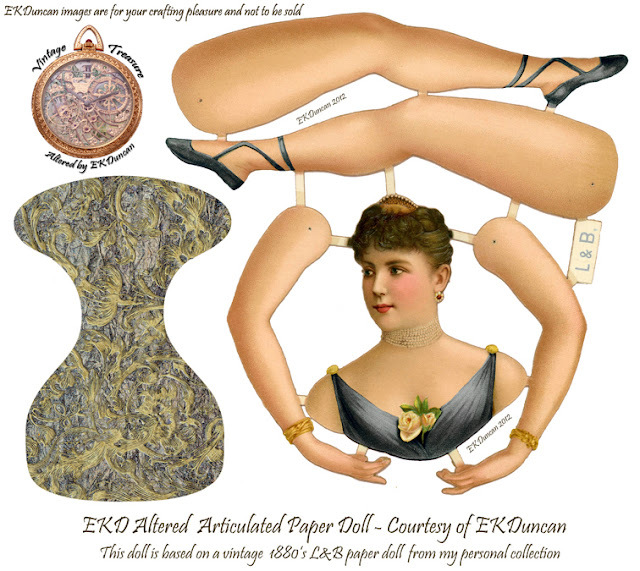 I didn't know anything about the history of articulating paper dolls and I really enjoyed reading about your journey collecting them. Hi Val - I'm so glad you are enjoying the posts. 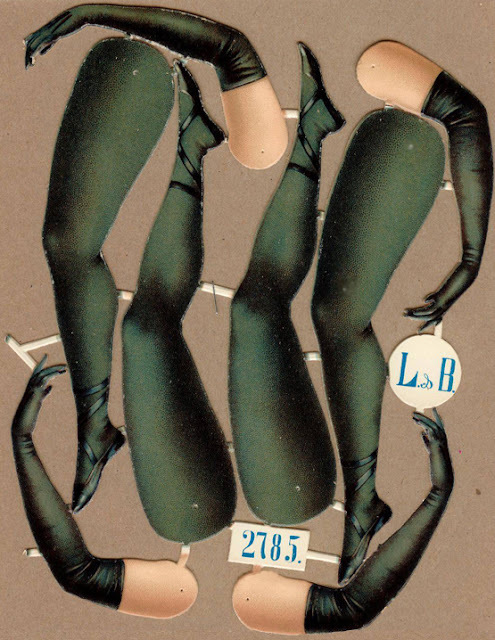 I have a blast collecting these fun jointed paper dolls and am always trying to find out more about them...but it's not easy. The information age of the internet helps some in unlocking a few truths but sadly many of the old time and very knowledgeable collectors of these aging gems have not shared their wisdom in a way that is easy to access. My hope is that they will be passing on what they know to a younger generation that will blog or post all the juicy information I'm still wanting to learn. A girl can hope! 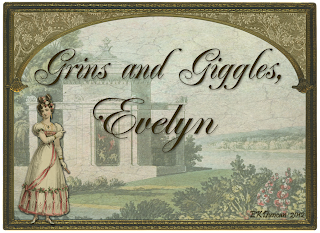 I'm glad to pass on what tidbits I learn and encourage others who know more to drop in and share what they know too. chic!thank u very much for sharing.Love them soooooooo much! Cool! Thanks for letting me know you like them. Hello Lissu - I'm glad you enjoyed making a whole collection of dolls and they turned out so pretty! Thanks for sharing what you created and for the link back to my blog. Hei Lissu - Olen iloinen pidit tehdä koko kokoelma nukkeja ja ne osoittautuivat niin kaunis! Thanks for sharing mitä olet luonut ja linkki takaisin blogiin.